[Kaitlynn Labit | Banner] Dr. Andrea Scott is the new dean of the Dr. Robert K. Jabs School of Business. She has served 15 years as a professor, served on both the Board of Trustees and Board of Visitors at Wheaton College and as the chair of the marketing committee on the board of the Los Angeles Chapter of the Susan G. Komen Foundation. The new school year brought a new dean for the Dr. Robert K. Jabs School of Business who is equipped with global experience and a vision of excellence for California Baptist University’s school of Business. 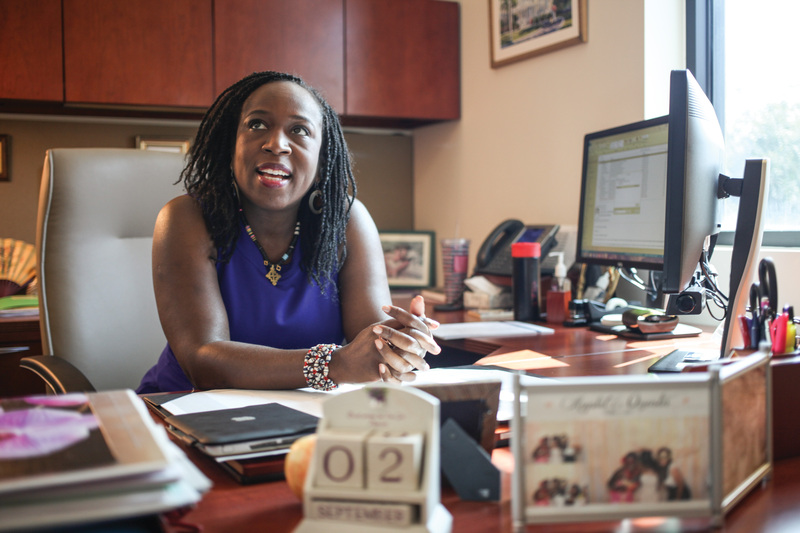 With more than 15 years of experience, Dr. Andrea Scott, new dean and associate professor of marketing, said she is ready to ensure success for graduates, business majors and the faculty members of the school of Business. “The opportunity to lead our faculty in the quest to cultivate excellence in our students is both humbling and exciting,” Scott said. Her past as a Fulbright Scholar, chair of the marketing committee on the board of the Los Angeles Chapter of the Susan G. Komen Foundation, her 15 years as a professor and her service on both the board of trustees and board of visitors for her alma mater, Wheaton College, are a few of her experiences that made her the most qualified candidate. Among her strengths both professionally and personally, her time spent in Kingston, Jamaica, is one of the greatest. Scott taught marketing, advertising and promotions, and consumer behavior to upperclass business majors at the University of Technology in Kingston. She is also the brain behind initiating a marketing communication research project with the Jamaica Ministry of Health for HIV/AIDS communication on the island. The project included ethnographic research among the producers, artists and governmental agents who were involved and responsible for advertising island-wide to raise awareness and provide education on the topic. Since the development of the project, the outcome of the work has been presented domestically and internationally. Scott said her faith in the students and faculty of the business program is strong. Her vision is that the School of Business would be the premier Christian business program in the area, not only strengthening business acumen and equipping graduates for success, but also providing an environment for each person to thrive in character development. “I am looking forward to nurturing a culture of mindful excellence where faculty, staff and students interact with our community in purpose-filled, redemptive and mutually beneficial ways,” Scott said.